Jean Stablewski, known as Jean Stablinski (born 21 May 1932, Thun-Saint-Amand, France, d. 22 July 2007) was a French professional cyclist from a family of Polish immigrants. He rode from 1952 to 1968, winning 105 races as a professional. He won the national road championship four times - 1960, 1962, 1963 and 1964. 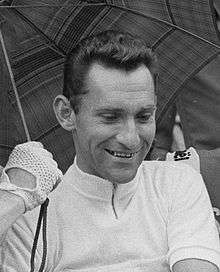 However he won the world road championship in 1962 and he won the first Amstel Gold Race in 1966 and Vuelta a España in 1958. Jean Stablinski was the son of Polish immigrants in the mining area of the Nord region of France. His father died in a work accident in 1946 and Jean, at 14, started working in the mine to provide income for his family. It was at this time that he won a bicycle in an accordion competition. Legend says that his mother was so displeased by her son's new hobby that she damaged his bike. Jean, still known as Stablewski, became naturalised as French at 16 and rode his first races. It was while riding the Peace Race that a journalist's error in writing his name 'Stablinski' created the surname by which he was known then on. Stablinski turned professional at 21. From 1958 until 1967 he rode in the same teams as Jacques Anquetil, always as a support rider, or domestique. 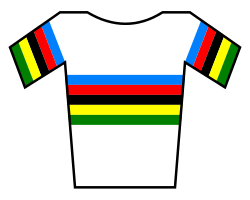 Stablinski won the national road championship four times and came second twice, all within six years, an achievement no rider has matched. Stablinski stayed with Anquetil until his team-mate wrote a series of newspaper articles, one of which Stablinski believed criticised him even though he had devoted his career to Anquetil. The two rarely spoke after that and Stablinski joined the team headed by Anquetil's biggest rival, Raymond Poulidor. Stablinski was recognised as a rider who made up for physical limitations by his tactical sense and his chance to profit from the moment. His knack, riders recognised, was to recognise which breakaway attempt would count and not to waste effort on the others. Stablinski was twice suspended for doping. 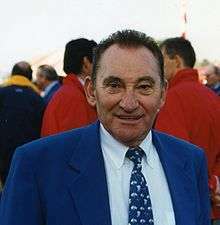 Stablinski retired from racing and was for six years manager of the Sonolor-Lejeune, signing Lucien Van Impe and Bernard Hinault as young unknowns. His son, Jacques Stablinski, born 1956, also became a professional cyclist and rode for Gitane-Campagnolo. He became known as "Petit Stab" but never had his father's talent. Jean Stablinski never stopped riding a bike until the illness that led to his death. He said he never put a drinks bottle on his bike when he rode for pleasure. He had spent too many years racing as a professional with no chance to stop and look around or to meet people, he told the historian Jean-Paul Ollivier on French television. If he had no water on his bike but a few euros in his pocket, he could stop and buy a drink at any bar he fancied and get into conversation with whomever he met. He became a member of Les Amis de Paris–Roubaix, enthusiasts and workers for the spring classic. It was Stablinski who suggested the cobbled path through the Arenberg forest. His qualifications were impeccable: as a miner he had worked beneath the road and as a cyclist he had ridden along it. He died after a long illness. On 7 April 2008 he was remembered by a memorial beside the Wallers-Arenberg road he had introduced to Paris–Roubaix. The memorial was made in blue limestone from Soignies by the sculptor Michel Karpovitch. Judycki, Zbigniew. "Jean Stabliński (1932-2007)". Forum Polonijne. 3 (2007): 30. ISSN 1234-2807.